This project ended successfully on 2/12/2016 12:00! All supporters will be documented with your name as a supporter printed in the Book. I ’ll send you a copy of «Beezza! The Kingbee Cook Book» to your home adress. I ’ll send you a handsigned and personally dedicated copy of «Beezza! The Kingbee Cook Book» to your home adress. You are invited to an exklusive, private beefood dinner hosted by Daniel Ambühl in the Stadionbrache Hardturm, Zürich, 1st June 2017, 6 – 9 pm. I also sign your book. You (and your partner) are invited to an exclusive, private cooking school event with beelarvas hosted by Daniel Ambühl in the Stadionbrache Hardturm, Zürich. 2nd June 2017, 6-10pm. We will prepare Beenoodles, Hatschi, Majanaise and have fun and dinner together. Would also make for a very special Xmas present, true? You and your friend/partner are invited to spend a weekend with me in the Hotel La Provence (Rheinau-Diersheim) 13th to 14th june. We visit a beekeeper, get some fresh Kingbees and I prepare with your help a nice beefood dinner. Short tour in the artists Dendrotekturpark, Breakfast, Music. All inklusive. What a nice Xmas present is that! Isn’t it? And one that makes sense too. You (and your partner) are cordially invited to an one-of-a-kind entomophagous dinner in my privat house in Unterterzen, Switzerland. I’ll open some nice bottles. You try a «Beehive Blues» or the «Drowning Kingbees« (Longdrink and shot with beelarvas) for the first time. 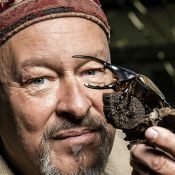 If you are brave enough I will show you the mysterious beetle cellars, where we breed and rear some of the most spectacular beetles of the world. And there will be enough time for me to thank you for your support. Date via Doodle. Artist, mushroom cultivator, insect breeder, author. Born in Zürich, Switzerland 1958, married, two children. Lives in Unterterzen, Switzerland.